The last week here on Oahu has been agonizingly humid, and for some reason all the fruit for sale in stores either looks really sad, is too expensive, or both. So in addition to being miserable, there’s nothing really cool and refreshing for me to snack on. Every time I go to the grocery store I tell myself that I’ll come out with some fruit no matter what and in the end, I come out with nothing but bananas. And cold bananas are weird. In the end, I had come up with my own solution. A few years ago, when we were picking out what trees to grow in the yard, I was insistent that we get a pomegranate tree. 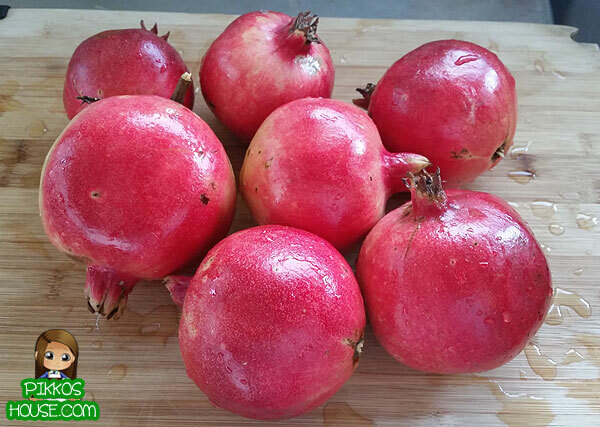 I buy the trays of gigantic POM Wonderful pomegranates from Costco when they’re in season during the winter months and end up frowning down at my yellow fingertips for weeks on end. But those things are hella expensive. I think the last time I wanted a tray it was something like $16. Which brings me back to our pomegranate tree. It grew for several years, and finally last year one of the little red fruits got to just about the size of my fist. I picked it, opened it with glee, and sighed. It was rotten, even though there was nothing on the outside to indicate anything was wrong. Talk about a bummer. I went to go look and sure enough, the tree was weighted down with fruit! Woohoo! I picked a couple last week and cracked it open to find slightly pinkish seeds. I tried to eat one and the seeds were basically inedible. The POM ones have soft shells that you can easily just chew up, but these were so hard I couldn’t even crack them. 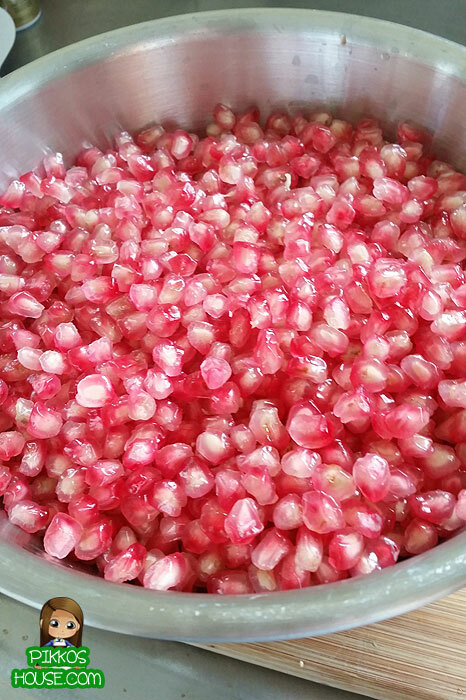 In the end, I made a small almost-full cup of pomegranate juice. The other day I picked seven more to make a pitcher of juice to help satisfy my need for fruity things. Don’t they look so cool? I’m so happy to have my own, and they’re so red, too! I’ve learned a lot over the years on how to easily split them open, and since I had so many poms, I could take a little assembly line photo. Starting from the right, you can see the process. First, you cut off the top, then you cut slits into the side of the pom going all the way down the side. Then you pop out that little center thing in the middle. This will loosen up your “slices” a bit. After that, you simply crack it open and then pop all the seeds out. If you’re thinking this looks like a ton of work, you’re right. I was pretty tired of seeding pomegranates by the time I was done, and the worst wasn’t even over. 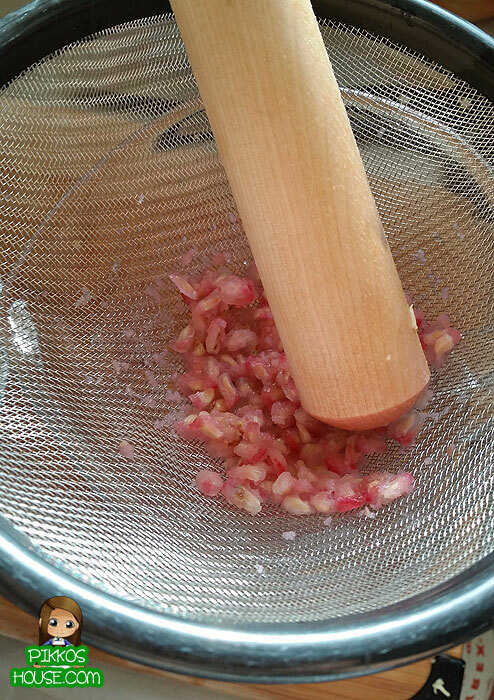 I began sticking handfuls of seeds into my strainer, which was set over my pitcher. Then I took a wooden… thing and began crushing the juice out. This took for-freaking-ever. In the end, I barely got up to 1/4th of my pitcher. Argh! I added some apple juice to get more volume and then chilled it. 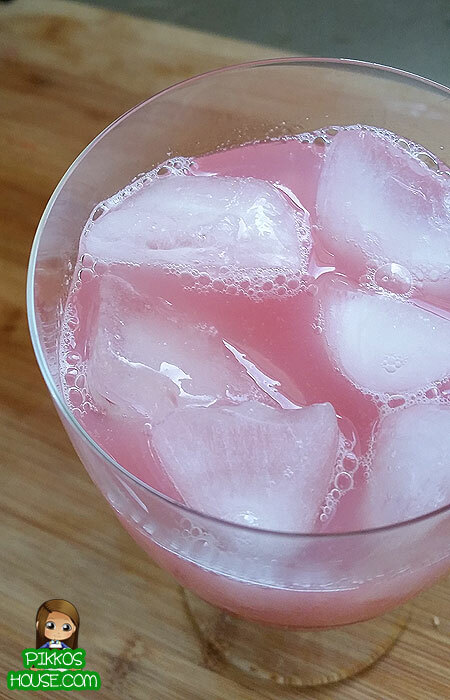 Next time I think I’ll pair it with lemonade, because then I could make a whole pitcher of lemonade and simply add the pom juice. Sounds like it could be amazing, right? 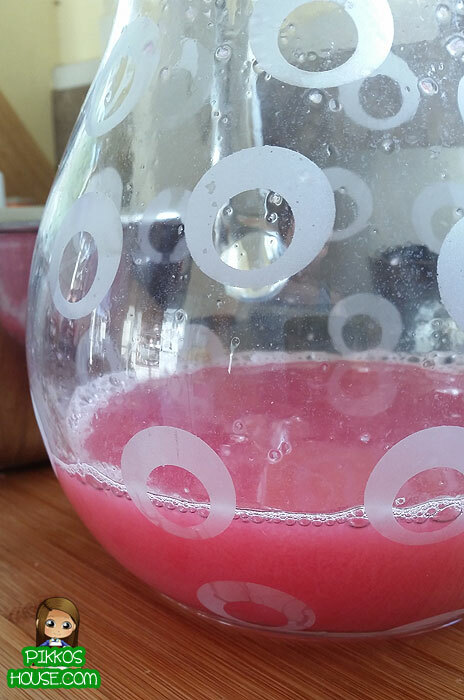 Overall, the pom-apple juice mixture was pretty amazing. You could taste the apple juice first, then the slightly tangy pom juice taste would kick in after. The perfect thing for a torturous, humid day.